We have had our motor home, Minnie Pearl since mid–September. During October we took a 3 week trip that included some dry camping at campgrounds. We have been doing lots of things to get her road ready for a longer trip where we will be living on board for a few months. Our motor home is ready to roll. We took her in to get our PA inspection since we bought her in Indiana and had the mechanics go over her with a fine tooth comb looking at all the belts, hoses and seals. They said everything looked ship shape and the oil looked good when they changed it and we should be ready to roll. When we bought the motor home, it had brand new Michelin tires on it. One thing we are adding to our tool arsenal in order to keep the tires in good shape is a Viair 400P-RV Portable Compressor Kit, along with a Slime Air Gauge that can reach into read the dually tires on the rear. Since we are going to be boondocking in the desert and some miles away from a service station, we thought this would be a good gadget to have. 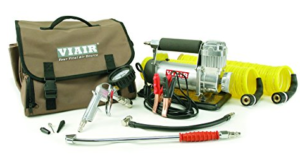 We also have found that not all service stations have air compressors that will go above 70 pounds. Let’s not get stranded with a dead battery. 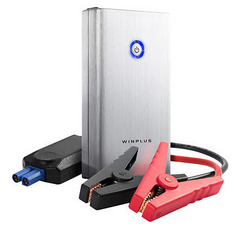 Another item we added to our emergency kit is a WinPlus Car Jump Start & Portable Power Bank. This is a device that will jump our battery and has polarity protection, but we can also use it to charge our USB devices via a USB and a Micro USB port. It has an LED flashlight with strobe and SOS mode. It is a very small case and we will be able to use it for multiple purposes. We used to carry a typical jump pack that had a battery jumper, air compressor and flashlight. The built-in air compressor was not strong enough for our motor home tires. Living in PA, we had to winterize Minnie Pearl after our last trip in October. In early January we will be starting our trip to the southwest in a winterized rig. Our rig does have heated tanks, but we have not done any true winter camping. We plan on driving straight through to Arizona in 8 or 9 days and hope we can un-winterize somewhere along the way. Any tips from other snow birders who have done something similar? Trying to stay on the light side. We also have been working on what to take with us and trying to down size our list. We got weighed at a truck stop scale just to get our base weight empty. After we leave Quartzsite, we plan on going to one of the Escapees membership campgrounds, North Ranch in Congress AZ. They have a program called Smart Weigh. This program weighs each wheel of your RV and provides the information needed to calculate the actual air pressure for each tire. That about sums it up for what we have done thus far concerning rig preparation. Anything you can think of that we missed? Drop us a comment! Looking forward to seeing you down the road! This entry was posted in Getting Started and tagged Quartzsite, Winterize. Bookmark the permalink.